The main task of a binary options broker is to bring supply and demand together on the option market. For example, if you expect Facebook shares to drop in value, and therefore open a 'lower' binary option on this equity, your broker will look for another trader who wants to open a 'higher' option and match your trades. This is not as easy as it sounds. What if there is no one on the 'other side' of the option who wants to buy the option? What if no one thinks that Facebook is going to rise? One of the tools that your broker has is to adjust the return on an option. To this end, the broker makes an estimate of how much supply and demand there is for a particular option. If too many people in the market think alike, then the broker offers the option at a lower yield, which means less people will buy the same option. Suppose traders have bought a total of GBP 10,000 in 'higher' options at an option broker on the currency pair GBP/USD and other traders have at the same time purchased GBP 8,000 of 'lower' options . Of these trades, the broker could match GBP 8,000 on each side with the other, and he runs no risk on that amount. For the remaining GBP 2,000 the broker himself will buy up 'lower' options to take the other side of the excess demand. This option broker does not want to risk losing if the GBP/USD indeed goes up (as the majority of traders expect it to do) and he therefore buys worth GBP 200,000 in US dollars from a major bank (this is called 'hedging'). After expiration of the option the price is of the GBP/USD exchange rate has for example increased with 50 pips (0.5 cents). Now the broker pays out the return to the traders who have bought 'higher' options. The broker suffers a loss on the on the GBP 2,000 of 'lower' options that he had taken himself, but at the same time, he gains GBP 1,000 on his USD position at the bank. In this case, his loss is only 1,000 pounds, and that he can pay by the difference between the positive and negative return (see below). It is never possible for the broker to cover all risk completely. But through a combination of estimating the market demand, calculating the required rate of return, and the hedging his own positions, the binary options broker can reasonably manage his risk. A binary option broker doesn’t do all of this for free. Yet you pay no commission or spread for trading binary options. How is that possible? This is due to the difference in return on your options. If you predict a binary option correctly, it usually yields a return of between 60% and 90% (except for 'high yield options'). If you are wrong, you lose the entire purchase amount, so 100% (except 'refund options'). Another example. A broker is lucky and has just as many 'higher' as 'lower' options to sell on the Google share: GBP 5,000 on both sides. 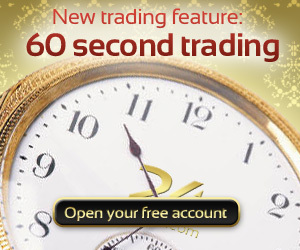 The return on these binary options is 85%. For selling these options the broker obtains GBP 10,000 (5,000 'higher' and 5,000 'lower'). As Google shares now go up, the broker makes a GBP 9,250 (5,000 + 85%) payment to the owners of the 'higher' options. The owners of the 'lower' options get nothing, and the broker makes GBP 750 in profits. Conversely, if the share drops, the 'lower' option holders get GBP GBP 9,250, and the broker still makes GBP 750 in profits. Usually, however, this is not as beneficial to the broker as he runs a risk on either side. The difference between the positive and the negative return on an option is the reward for the broker. From this return he has to cover the cost of hedging his positions as well as all other operational costs. What remains is the net profit of a binary option broker. If all goes well, you will notice very little of your broker's activities. In the trading software of your broker you can see exactly how much return you get on a binary option in advance, and a reliable broker always delivers. How the broker covers its own risk is not your problem as a trader. Most binary options brokers are also major financial companies with a large enough capital buffer, so you don't have to worry that your broker will default. For you as an option trader, it is far more important what a binary options broker does for you directly: provide a good product range; offer professional trading software; support you if you have any questions; and sometimes give you something extra, like a lucrative bonus or a free webinar. To find out which binary options broker is best for you, read our binary options broker reviews.